Footprints in the sand led downward, into the canyon. A voice on the wind whispered. “Follow. Follow the footsteps.” I looked again for the tracks. They had vanished. The cinderblock government building felt crowded. A few Rangers. A few hikers. The shelves were full of books about the geology of the Southwest, Anasazi culture, and desert wildflowers. There were posters on the walls—arches, sandstone spires, pictographs. Candy, chewing gum, pain-relievers, and gallon jugs of water were on the counter. T-shirts the color of the sand outside hung on a rack. “Grand Gulch, Utah” was emblazoned across them in black, bold letters. We stepped outside. Squinting light bounced off the asphalt. The day was getting warmed up. “We’d better get moving,” I said. Packs were heaved onto shoulders. Buckles snapped. Cinches pulled. Pictures made—optimistic trailhead smiles. 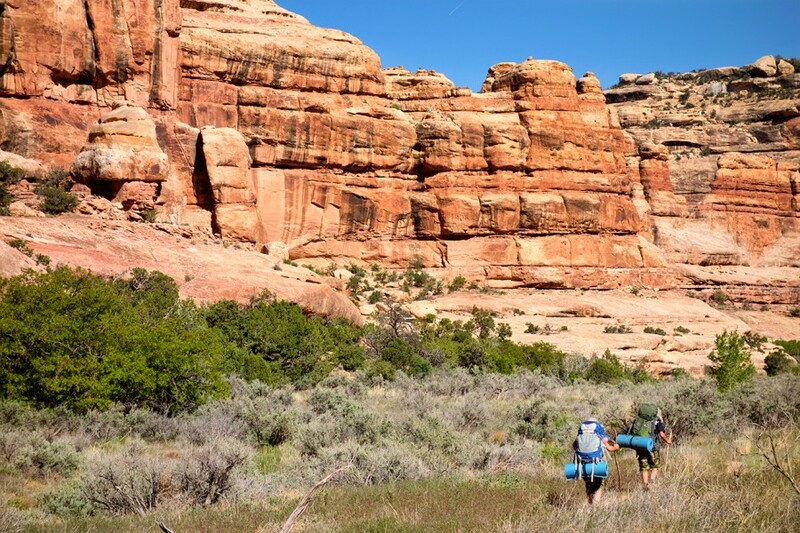 Six of us—my two boys and me, Jeff Higham, and his two sons—left the Kane Gulch Ranger Station and Utah Highway 261, and began our walk into the wild unknown. We crossed a sage meadow dotted with piñon, cedar, and aspen trees, and gradually descended into the well of the canyon. The scent of fragrant sage filled the air. The low buzz of zipping insects hummed faintly. Dust splattered our shoes. We stopped often to adjust packs, eat Skittles, and sip cold water. The rugged descent gave way to a soft, meandering path. We zig-zagged down the serpentine canyon following the trail around jutted outcroppings, into grottoes, arroyos, and massive amphitheaters. Lunch. And then more walking. The boy’s eager excitement dimmed. The afternoon waned. Feet, shoulders, and hips ached. Evening appeared. The heat of the long day retreated. “How much longer, dad?” Teichert, my 9-year-old, asked. Teichert walked with his head down, feet dragging in the dust. Harry, his 11-year-old brother, sat down on a chair-sized boulder and waited for us to catch up. The relentless sun had ducked behind the canyon rim. Golden light filtered through the leaves of cottonwood trees and bounced off varnished sandstone walls. The air was thick and stale. 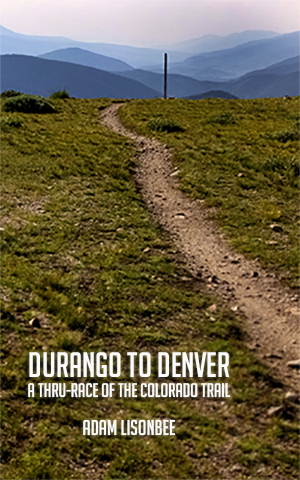 A faint trail slithered through tall reeds and into the depths of the long and winding gulch. The trail followed the sandy bottom, where angry floods had moved trees, boulders, and brush into massive piles of death and decay. Old-growth cottonwood trees had wrappings of willows, branches, and rocks piled at their feet. Stringy grass was draped like tinsel on fat sage bushes. Intermittent pools teemed with insects, frogs, and algae. Tracks of lizards, mice, rats, and birds littered the beach. “Are we almost done hiking?” Teichert asked, again. We filtered water from a clear pool while the boys, suddenly lighter without their heavy packs, skipped rocks and poked things with sticks. “Oh, gross!” they yelled. “Look at that dead cricket floating in the water.” I handed Harry and Tyke their canteens, dripping wet with fresh pond water. I took a long draw from my own canteen as a show of good faith. The water tasted stony, like the slickrock basin that held it. But it was clean, and wet. The boys sipped reluctantly at first, but soon gulped the water loudly. We made camp in the dusky shadow of Split Level Ruin. Stars shyly emerged from the cover of daylight. The warm walls of the canyon cooled in the twilight. Red and orange turned blue and gray. A poorwill’s song echoed softly through the alcove. The boys were tired and grimy, just like their dads. A warm dinner, chewy treats, and cold water brought the boys back from the dead. Soon enough, they were causing trouble again. But not too much. Shortly after dark, we crawled into our sleeping bags and listened to a chorus of bullfrogs lull us to sleep under a sky splattered with winking stars. Grand Gulch is a 60-mile labyrinth that begins high on Cedar Mesa in southeastern Utah, and gradually descends deeper and deeper into the earth, until it terminates in the San Juan River. The canyon is full of tamarisk, sage, Mormon Tea, prickly pear, cheat grass, willows, and cottonwood, juniper, and piñon trees. Sheer red-rock walls rise above the teeming canyon floor like a fortress. Water can be surprisingly abundant, filling slickrock basins deep enough to swim in, running happily out of hidden springs, and pooling in sandy bends after flash floods and rainstorms. But more important than what Grand Gulch is, is what Grand Gulch once was. 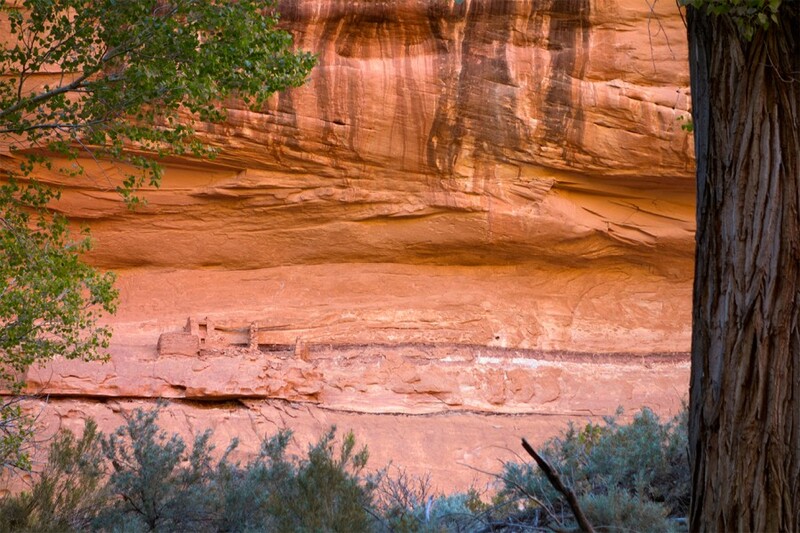 Scores of decades have passed since the Basket Makers and Cliff Dwellers made their homes in this, and other similar canyons across the Southwest. 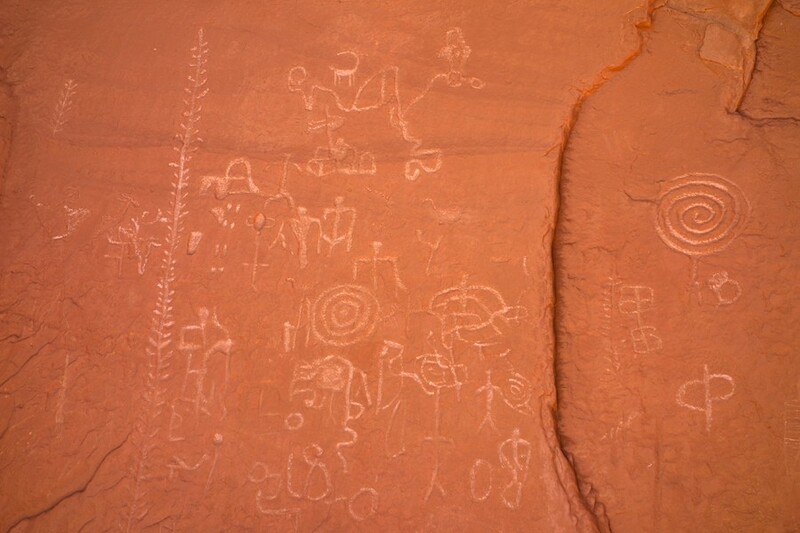 Throughout the gulch there are scattered remnants and ruins of a lost world: pictographs and petroglyphs, stone cisterns, homes, and kivas. The art is sublime, and often accompanied by handprints of the author. Much of the evidence left behind by the inhabitants of Grand Gulch was found, collected, and tucked away in museums and the hands of privateers by the Wetherill Brothers during the 1890s. What they didn’t take is left for us to see and, hopefully, let alone. One careless hiker could inflict irreversible damage. In a few short violent minutes, vandals could erase what a thousand years of wind, sun, and rain, could not. The canyons of Grand Gulch leave many ancient clues to see, wonder about, and speculate on. Ruins remain intact, with unmarred art, shards of pottery, broken tools, and corn cobs photographed instead of pilfered. The beauty of the canyon is obvious. But the ancient, unexplained society that thrived among its sandy, fertile floor gives deeper meaning to the natural splendor. We walked in an old place, where people lived and loved, fought and died. That some of the buildings and art still exist for us to enjoy is an immeasurable privilege. A lone frog croaked among the dewey reeds. Pale blue light filled the rocky amphitheater, displacing the black of night. A cloudless sky stretched like a dome over the ceiling of the narrow canyon walls. A few stars lingered, watching the sunrise before retreating into the dawn. The air was light and cold. Split Level Ruin stood silently on the rocky slope above camp. A thousand years ago, others woke to the same pale light, relentless bullfrogs, and rounded canyon walls. Had anything changed since the nearby ruins gleamed with new, wet mud? Time held no sway in this eternal bottom. What were days, years, and decades in this place? I crawled out of the tent and stretched in the cold gathering light. Harry and Tyke snored softly. They could sleep a while longer. Rabbit was being roasted over a juniper-wood fire. Children laughed in the breeze. Women carrying skin-bags full of water walked up the trail through small, irrigated fields of squash and corn. Men repaired thatched roofs, and talked quietly about hunting in the plateau forests and thick side-canyons. An old woman was making a turkey-feather blanket. A scout stood on a high ledge, watching the maze that uncoiled east and west. A low murmur of activity bounced around the rocks as the village woke up. By mid-morning we had hiked a few more miles down the soft bottom of the gulch. We climbed over slickrock dunes, across sandbars dotted with heron scratchings, and through thick marshes. We saw a few more ruins. More paintings. More clues from an untold history, and a forgotten, unknown people. Horseflies buzzed in the heat. The trees stood still, no wind to nudge them. The sand in the wash reflected the noonlight like a photographer’s bounce-board. Our canteens were light, our feet were heavy. At the mouth of Sheik’s Canyon, we found shade and damp, cool sand. Jeff and I left the boys to their lunches–cut salami and crackers, raisins and cashews, freeze-dried ice cream—and went looking for the spring in the side canyon. We found the water, good, clean water, from clear, sandy-bottomed pools. But it was the paintings that brought us, boys in tow, back to the spring a few minutes later. 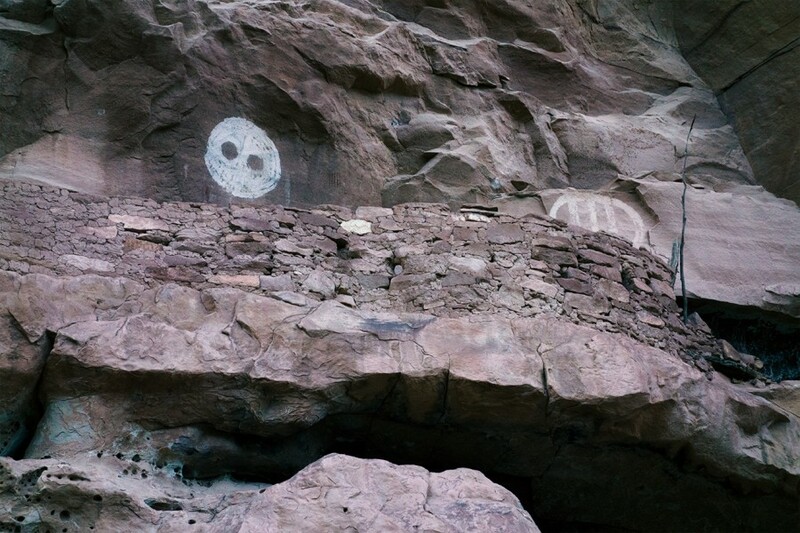 A long panel of rock was covered in pictographs: headless bodies wearing beaded dresses, turkeys, goats, smaller human figures, paw prints, bird tracks, pinwheels, snakes, vines, flowers, and handprints. Among the art was a streak of yellow and green paint—the Green Mask. Some of the drawings were thought to be 1500 years old. Was the ruin a sacred location? A place where the Old Ones performed rites of passage and ceremonial rituals? Or was it simply a practical location for long-term residency because of the nearby water, shelter, and plateau access? What did the drawings mean? And whose handprints dotted the walls? Walking through time prompted more questions than it answered. When we neared the confluence with Bullet Canyon, the walls of the gulch closed in, and the trees grew tall. The mild claustrophobia that persisted at the bottom of the canyons became more apparent. Wind whispered in the canopy. Trees swayed in time, an eternal dance, gentle and comforting. Kane Gulch curled westward, downward. Bullet Canyon climbed upward, and to the east. We turned left, into Bullet, and began our ascent. “Can we sleep now?” Teichert asked. “Ok”, he said, not confidently. “Have we seen any other kids here?” I asked. He perked up a little. But I knew he was exhausted. I pulled him next to me with my trekking pole, and sang from The Lord of The Rings. Shadows stretched across the sandstone domes and sage fields. Vertical stone walls glowed orange in the late light. Stringy clouds floated in the deep blue sky. We walked underneath a white, haunting face painted on the cliffside. That evening Harry and I hiked to the ruin. We sat on the ledge, and looked across the treed valley. Gloaming twilight settled softly into the bending canyon. “This has been a hard hike,” Harry said. “Back to ice cream!” He said. We both grinned. Ice cream sounded good. 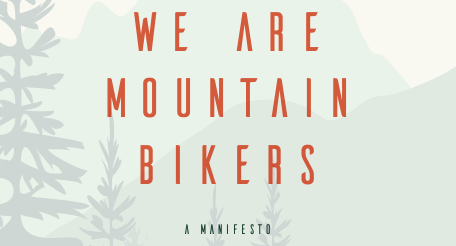 Over one hundred years ago, Prudden wrote that in this place, “You get down to sheer manhood, face to face with the bare, relentless fascinating, old earth.” The complexities of modern life dry up in the canyon country. The buzz of cell phones, the blare of traffic, and the soft blue glow of high-definition screens are forgotten. The addictive connectedness that imprisons us all breaks under the weight of unfiltered sunshine, stifling canyon air, and smooth, steep sandstone walls. Life is stripped down to simple, obvious, necessities. Water. Food. Shelter. Grand Gulch is a primitive, isolated, potentially dangerous place. The same as it has always been. It is still the canyon that the Wetherills explored in the 1890s. Still the canyon that the Ancient Ones called home. Hard to travel through. Harder yet to live in. Crickets chirped. Pale moonlight flirted with the rim of the canyon. Jeff and the other boys had joined us at the ruin. The kids talked about computer games and movies. When they started to throw rocks over the cliffside, we knew that they were feeling good again. “OK.” One more rock sailed over the ledge. Jeff and I looked at each other and shook our heads. “This is easier without kids,” he said. “Yeah, but so is everything,” I replied. A chill rattled through the air. Overhead, stars bubbled in the night sky. An incongruent wall of blackness, like a Navy battleship, broke the horizon. The canyon was still and quiet. Soft glowing embers lit a village of mud houses. People were gathered around a fire. One of the oldest among them was standing, telling a story. “The reed grew taller, and taller until it reached into the sky. Our fathers and mothers climbed the reed to escape the darkness. They came here, to this world, and to these canyons…” A few of the women softly hummed a sweet, sad song. Children listened, their faces aglow with flickering firelight. The vision faded into the darkness of night. I sat on a dome of white sandstone. Lichen was etched across the rock. Moonlight reflected dimly on the stone. Instead of a village, our tents glowed dully in the gloom below. The boys were asleep. No sound. No wind. Utter stillness. Time disappeared. Ages paused. We were shadows. Wind. Here and gone. Eons made this place. And were making it still. We, like the ancients, came to Grand Gulch, stayed for a time, and disappeared. A man my age was sitting on a sandrock ledge. Two boys sat by his side. He had long, dark hair. Deep, brown eyes. The boys had white paint on their hands. He held a clay jar in one hand. His fingers on the other, were stained with yellow paint. He smiled. I blinked, and he was gone. Harry and Tyke stirred. They yawned and stretched. And then laid down again. I made oatmeal. They wanted Pop-Tarts. We left our juniper trees behind, and walked up the meandering trail. We climbed out of the timeless, ancient world of the Basket Makers and Cliff Dwellers. We ascended from the primitive, into the modern. A rounded bend revealed glinting glass and aluminum. The parking lot. The vehicle. Suddenly it was 2014 again. A lump swelled in my throat. My eyes welled with tears. The boys smiled and laughed. “Let’s go get some ice cream!” Harry shouted. A distinct melancholy draped over me like a blanket. Leaving the solitary certainty of the canyon country was bittersweet. Jeff and I shook hands. “Indeed,” he replied. We dropped our packs in the sand for the last time. A lost highway unfolded into the horizon. The sun bowed, and disappeared behind a twilight curtain. All four boys slept in the car, their faces stained with chocolate ice cream. Willie Nelson was on the radio. Nightfall swallowed the desert. A sea of blinking lights sparkled in the distance. Cool, Those kids certainly hung in there very well. They seemed to be well behaved. LOL I ‘m not sure I could even stayed determined enough to do that hike. Good job. FYI I use the weather app from http://www.islikley.com to plan all my outdoor events. Has several personal type features also. Good Work! Great writing! You have inspired me to take my kids out on an adventure!